Prunus africana is a large, straight, evergreen tree often growing to around 20 m in height and occasionally with buttressed roots. Despite a wide natural range, spanning across Africa, this species is over exploited as it is highly sought-after for its medicinal uses, which has led to its threatened status. The bark of P. africana is green to grey on young trees becoming almost black and flaking raggedly on older trees. Leaves are elliptic, simple, leathery and green, often with reddish petioles. Flowers are arranged in clusters with very small petals, woolly margins and multiple stamens. The fruit is a drupe, red to dark brown when ripe, containing 1 or 2 oval seeds. P. africana is native to the montane regions of sub-Saharan Africa and the island of Madagascar. It grows in lower, upper and high montane forests, usually in forest gaps or on forest edges generally above 1500 m.
P. africana is an important tree for local livelihoods and international trade. The timber was previously much sought after; because it is straight-grained, quite heavy, hard and strong, with a dark red colour and gives a nice polish. It was used for heavy construction such as bridges, decks and flooring and also in the production of poles, carvings, tools and utensils. However, the biggest threat to this species is the overharvesting of its bark and leaves for their medicinal properties. The bark of this tree yields a valuable medicinal product used to manufacture treatments for benign prostatic hyperplasia sold internationally. The drug made from the bark extract was patented in 1966. The bark is harvested in the largest quantity of any tree species and this has lead to international concerns about sustainability. The world market is robust and projected to increase. Retail value of P. africana products is estimated at over USD 200 million annually, and is possibly considerably more. P. africana is currently protected under appendix II of CITES meaning that trade in this species is only permitted if an appropriate export permit and certificate of origin from the member country is held. However several of the countries that are party to CITES have been unable to monitor trade due to a lack of resources and it has done little to stop illegal exports and over exploitation. There has been strong interest in developing P. africana as a plantation and agroforestry crop. P. africana is moderately fast-growing and is quite adaptable to different conditions. BGCI is working with African botanic gardens to promote its use in ecological restoration. 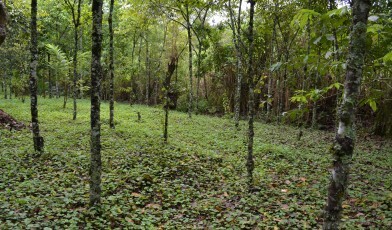 Conservationists in Africa have begun planting P. africana. Cultivating the tree on farms and including it in forest restoration programmes will help to alleviate the threat of extinction. This species is involved in the BGCI project Enhancing tree conservation and forest restoration in Africa. This project aims to promote the use of indigenous and endangered tree species in forest restoration projects across Africa.